A person yells "YOLO" right before taking off their clothes and runs around your place of business. What does YOLO mean? I'm about to run around naked. What does the phrase "Bachelor Sip" mean? A friend of yours referred to another person as an "Askhole". What do they mean? What does a "Name Shame" mean? You have known a person for awhile but have forgotten their name. What has happened when one or more people in a room say "Bye Felicia!" Someone just referred to you as having done a "Crapella". What did you just do? A friend wants you to go to a party but you don't want to. You decide to give them the "California No". What does that mean? You and your friend have just experienced a "Moon Landing" together. What just happened? Congrats! You are an urban dictionary expert. Sorry but you are not an urban dictionary experts. Perhaps you should try avoiding speaking with people younger than you. The meanings of words change with every generation. If you don't keep up with how the kids are using words today, you'll be lost tomorrow. 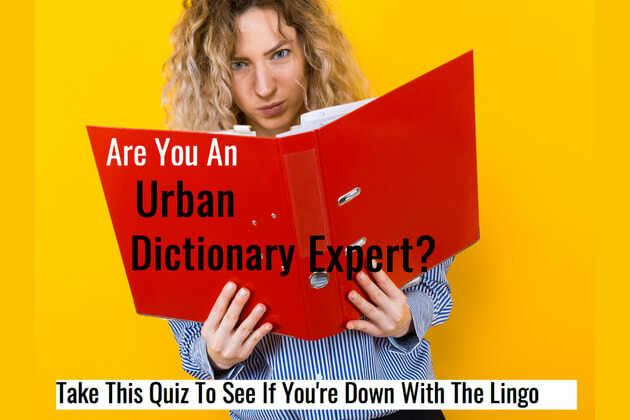 Take this quiz to see if you are an urban dictionary wiz!